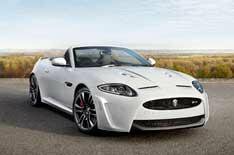 Jaguar XKR-S Convertible makes LA debut | What Car? The Jaguar XKR-S Convertible unveiled today at the LA motor show is the car maker's fastest open-topped GT yet. Its the drop-top version of Jaguar's flagship XKR-S coupe and uses the same supercharged 542bhp 5.0-litre V8 engine. The XKR-S Convertible has a 0-60mph time of 4.2 seconds and a top speed of 186mph: identical to the hard-top version's figures, thanks, in part, to an increase in weight of just 47kg. The convertible has the same range of upgrades as the coupe version, including a redesigned suspension set-up, with stiffer springs and dampers, and a reduced ride height. An upgraded Adaptive Dynamics system lets enthusiastic drivers push the limits, with a Trac DSC mode that reduces the level of electronic intervention. Another contributor to the XKR-Ss power is the Performance Active exhaust system, which should also bring a distinctive soundtrack. The XKR-S Convertible also benefits from the same series of visual changes as the XKR-S coupe, with wider, lower bumpers, a large rear wing with carbonfibre insert and new sills. There are bespoke 20-inch alloys and a choice of six colours. Interior changes also mirror those for the coupe, with 16-way adjustable leather sports seats trimmed in carbon and leather. The roof lowers in just 18 seconds. The Jaguar XKR-S costs 103,000.